I say “sort of” because I don’t really think voting is terribly important. And I certainly don’t think there’s a duty to vote – Athena forfend! Moreover, the usual arguments in favour of voting (like “if you don’t vote, you can’t complain” – which Spencer nicely disposed of in 1851) are generally much worse than the arguments against. Still, there are some common (in libertarian circles) arguments against voting that don’t convince me. Let me briefly say why. The voluntaryist argument is that by voting one immorally and imprudently lends one’s sanction to the state. I’ve responded to this argument a decade ago (see here and here), and don’t have much to add. Another common argument, especially popular with economists, is that voting is irrational, because (barring the overwhelmingly unlikely possibility of the election’s being decided by a single vote) the outcome will be the same however, or whether, one votes. Even if one’s aim in voting is not to get one’s candidate elected but merely to increase the candidate’s vote totals for strategic reasons, still whether that result happens is independent of whether one personally votes or not – so why vote? But if that were a good argument against voting, it would be an equally good argument against contributing to any cooperative effort whose success depends on other people’s cooperating also. And so, for example, it would be an equally good argument against being a libertarian activist of any sort – since no one libertarian activist’s contribution is likely to make the crucial difference as to whether libertarianism triumphs or not. I would even say that we have a duty to make a contribution to public goods. But it’s an “imperfect” duty in Kant’s sense, meaning that we need only contribute reasonably often to a reasonable number of public goods; we’re not obligated to contribute to every public good on every possible occasion. Hence one has no duty to vote (despite Peikoff’s bizarre assertion – which I’d love to see him try to make to Howard Roark – that “anyone who … abstains from voting in this election has no understanding of the practical role of philosophy in man’s actual life”), since it’s a matter of choice which goods one contributes to and when; but one is certainly free to pick voting as one of the occasions for the exercise of this duty. In response to this reply John T. Kennedy writes that my comparison between voting and other forms of libertarian activism, such as blogging, would be correct only “if the expressive power of your vote were equal to the expressive power of your writing.” But in fact, he argues, “[t]he difference in leverage between the two actions is so overwhelming that it would clearly be counter-productive to waste time voting when that time could be better employed improving your next blog entry.” I would note, however, that this response is a retreat from the standard economic argument against voting to a weaker position, namely that voting makes a smaller contribution to the ultimate triumph of libertarianism than other forms of activism (though participating those other forms probably won’t make the decisive difference either). Well, then, should I specialise in whichever one form of activism I think will make the greatest overall contribution? Should I focus on scholarly articles and forget blogging? Or should I focus on blogging and forget scholarly articles? It seems to me to make more sense to diversify. A third objection to voting, the agorist objection, is one I have more sympathy with. On this view, the best strategy for achieving a libertarian society lies not with an attempt to seize the reins of power (whether by electoral or revolutionary means) but rather with an attempt to encourage people to withdraw consent to the state through mass disobedience, and this strategy involves education and building alternative institutions, but not necessarily electoral politics. Indeed, so runs this argument, trying to get people to vote is counter-productive, since we should be discouraging rather than encouraging people’s attachment to the rituals of the state. Now I certainly agree that as libertarian strategies go, education and building alternative institutions are much more important than electoral politics. And I also agree that the danger of reinforcing people’s attachment to the state is a count against urging people to vote libertarian. (I say “vote libertarian” rather than “vote Libertarian” because the Libertarian candidate is not always the most libertarian candidate – especially in light of the recent unpleasantness in Portland. On the other hand, I don’t think the “don’t waste your vote” argument against voting Libertarian is any good; see once again here.) But I also think voting can be useful as a means of self-defense in the short run; and while the ultimate revolution will be preimarily from the bottom up, it will certainly go more smoothly, and with less danger of a violent crackdown from a government desperate to maintain power, if we’ve got some support on the inside too. I think I’m consistent with the economic argument that voting in large elections makes a *negligible*, not just small or smaller, contribution to the result. A blog need not be negligible, it’s entirely conceivable that a blogger could someday tilt a national election. Matt Drudge (not a blogger per se, but you get the idea) has probably had a major effect on some elections. But diversifying into activities with negligible return makes little sense. If one don’t fulfill that supposed duty, who are the injured parties and to what relief are they entitled? Matt Drudge (not a blogger per se, but you get the idea) has probably had a major effect on some elections. But wouldn’t it be dubious for Drudge to encourage people to vote, yet refuse to vote himself? That’s like asking everyone else to help clean up after the picnic, yet not do so oneself. It might well be true that I would make a much bigger contribtion to the cleanup through my exhortations to others than through my own efforts, but given those exhortations I ought to follow suit. It’s not an enforceable duty; it’s a duty of virtue, not a duty of justice or rights. So the question of “entitlement to relief” doesn’t apply. What’s a duty of virtue, and why does one have have one? What is the harm in failing to satisfy a supposed duty of virtue? Or is there no harm at all? What’s wrong with that as long as they’re free act as they see fit? 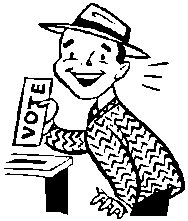 In the case of voting they usually have no way of knowing whether you vote or not. By law they have no way of knowing who or what you voted for even if you did enter the booth. What would be wrong with Drudge convincing millions to vote against Clinton and then flipping a coin to determine his own vote when he got in the booth because he knew his individual vote didn’t matter? Everybody gets the same political return and nobody else knows he voted for Clinton because the coin came up tails. What’s the problem? John T. Kennedy: What’s a duty of virtue, and why does one have have one? That’s like asking “what is morality?” — which is rather too large a topic for the comments section of a blog entry. I can go on a long philosophical harangue if you want. But wouldn’t most people agree that there are things we morally ought to do over and above just not violating people’s rights? A legitimate claim of others upon oneself is violated. Don’t know whether “harm” is the right term for that or not. I’m not a consequentialist, if that’s what you’re asking. What would be wrong with Drudge convincing millions to vote against Clinton and then flipping a coin to determine his own vote when he got in the booth because he knew his individual vote didn’t matter? What’s wrong with cheating on your spouse if your spouse is guaranteed never to find out? Well, it’s dishonourable. Isn’t that enough? Thanks, but I don’t think I want to appeal to that argument, since I don’t accept a Bayesian approach to rational choice. Most people agree we ought to have government and taxes. Is that supposed to be an argument? I subscribe to Spooner’s distinction which divides moral infractions into crime (harm to others) and vice (harm to self). Declining to go out of one’s way to produce public goods doesn’t fall in either category. If their claim is legitimate then why aren’t they entitled to enforce it? Well, Spooner divides harm into those two categories; I don’t know whether he thinks that exhausts the moral realm. In any case, I subscribe to Spencer’s division of our other-regarding duties into justice, negative beneficence, and positive beneficence. In any case, any moral wrong is a harm to oneself. Because they have a duty of non-aggression.